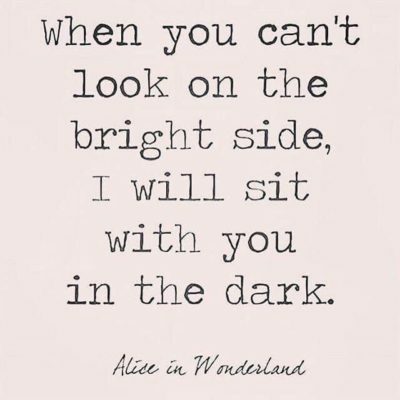 The quote from Alice in Wonderland: “When you can’t look on the bright side, I will sit with you in the dark,” strikes a chord with us here at ZARZAND. Supportive, yet based in reality. We suggest kicking back at those dark times with some dates that actually use the concept of darkness to lighten the load, if even just a little. Game on! Just how dark of a room can you find? Would adding a blindfold add to the goal? Grab yourselves some small light-weight targets such as: toilet paper tubes, paper cups, an empty pop can, paper lunch bags, medicine cups, a pile of Softwick sponges, etc. Line them up across the room from you, and then using wadded up paper balls, or a nerf gun, rubber bands, whatever you keep handy, to take turns knocking the targets down. Learn to take comfort in some dark places: Go for a drive at night or just before dawn, and simply hold hands if that’s doable. For those who pray, maybe this would be a great time to join together for a few minutes out loud. Drive in the quiet and enjoy that or throw on a song list of encouraging music. Read or listen to a book on CD or podcast that helps refocus or just takes you minds off your current details even for just a few moments. Remember blanket forts? Last, but not least, crawl under the covers together if doable, and just spend some time using whatever body part suits you best, to slowly just touch and caress one another. Arousal does not have to be the goal here. It can, but it’s more a time to connect intimately without the expectations arousal can place on partners during stressful times. However you track, sit with one another in the dark times. Better days are ahead.